High Quality Content by WIKIPEDIA articles! 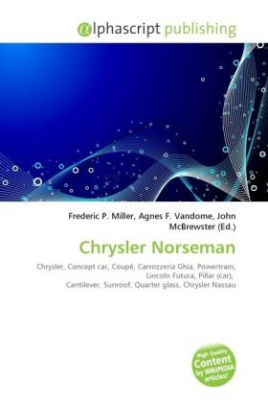 The Chrysler Norseman was a concept car built in 1956. It was a four-seat coupe. Although designed by Chrysler Corporation's stylists, actual construction was contracted out to the Italian coach-building firm of Ghia. Ghia already had experience in the construction of low-volume vehicles and one-off prototypes, having built the very successful Lincoln Futura concept the previous year. It took Ghia's craftsmen well over a year to build the complex Norseman. Chrysler wanted a fully drivable vehicle, not just a rolling mockup, so all normal systems for the powertrain, braking, suspension, etc. had to be installed. Much more difficult to fabricate was its unusual cantilevered roof, which was secured to the body only at the rear C pillars. There were no side pillars, and at the front the roof rested only lightly on a fully frameless windshield. There was a power sunroof as well, an advanced feature at the time, and difficult to integrate into a slender roof structure with no structural support at the front.